Fiona is Just Love's Scotland Coordinator and also heads up our media and communications. She currently works with groups in Glasgow, St Andrews and Dundee. 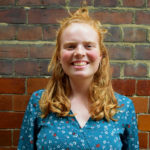 While at university in Glasgow Fiona studied Theatre Studies and was part of the first Just Love committee, working on their social media and then as their co-president. Alongside her work with Just Love Fi works as a freelance drama facilitator and is part of a missional community at her church. She enjoys creating things, making new pals, climbing hills and wearing multiple items of denim simultaneously.